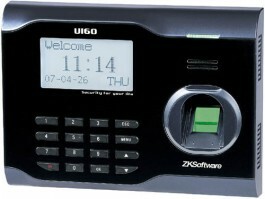 U160 is a standalone biometric terminal for Time attendance management based on fingerprint and password identification. U160 has built-in Linux operation system. Memory stick solves the problem of no PC in local site. And U160 with Remote Identification System is a good solution for personal management of a company with 1000-5000 staff. The identification speed is within 2 seconds. U160 with Web management lets you navigate the records in it trough TCP/IP at your convenience. 2007 Version of algorithms with dependability and accuracy, identification speed obviously improved, process 3000 fingerprint, no matter good or poor, within 2 seconds.